Ashdown Guitar Lessons is delighted to make available to everyone who wants it a set of charts giving fretboard patterns for Major scales and their associated Major 7th arpeggios. If you didn’t know, it all starts here. 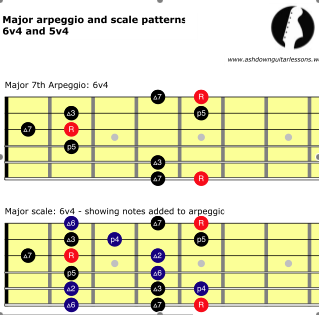 From these scales you can derive all the other modes/scales and their arpeggios. We’ll be making other sets available over time that spell out exactly how to do this and how to put all this good theory to work in your improvisation. The approach is based on that of Jimmy Bruno, Jody Fisher and others – if you haven’t checked out their work you’re doing yourself a disservice. This is foundation stuff on which everything else is built and it’s essential for any improvising guitarist. These scales and arpeggios should be practiced in all keys every day until you can play them in your sleep. Then play them in your sleep as well!